A few years ago Dana White, a man who apparently believes in absolutes, said that he would “never allow women in his octagon.” To his own financial delight, White gobbled down his own words when he not only started putting women headliners on his programs, but decided to have season 20 of “The Ultimate Fighter” be exclusively all-female. While it would be exhilarating to say that the rise of women in the UFC has been heavily publicized, the truth is that it’s the rise of a particular woman that seems to have garnered the majority of the attention. Ronda Rousey’s name is synonymous, if not currently the autonomous representation of women fighters in the UFC. See Audrey’s post to this blog, Can the UFC handle a Roy Nelson? Or is it all Rouseys? It’s not difficult to see why Rousey would be the headliner for women in the MMA word; she is an Olympic medalist (Judo), remains undefeated in the octagon, and she’s an undeniably, easy on the eyes California girl. While her ascent of the UFC ladder is both respectable and inspiring, her monopoly on the sport creates an interesting dilemma. Ronda Rousey simply can’t be the peak of women’s presence in the ring. Take Cristiane Justino (also based in California), for example. She is a lethally trained trained muay thai aficionado. She was 2013’s Featherweight of the Year, and is currently ranked as the #2 pound-for-pound female MMA fighter (right behind Rousey, of course). A quick Google search for “women in the UFC,” however, will return a plethora of articles about Rousey, with only a few mentioning other women (like Justino). 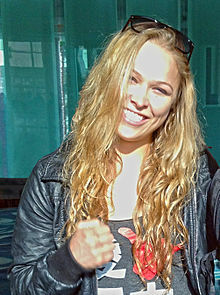 Much of what arises details a feud between Rhonda Rousey (and subsequently Dana White) and Justino. White and Rousey both took shots at Cristiane Justino over Justino’s suspension as the result of a positive steroid test a few years ago. Interestingly enough, both White and Rousey took stabs at Justino’s physical appearance. White made the observation that Justino “…looked like Wanderlei Silva in a dress and heels.” However, numerous men in the UFC continue to also test positive for PED’s, without any sexist heckling from Mr. White. Justino made a mistake years ago–and paid the price. Shouldn’t she be allowed to move on with out being chastised for her physical appearance? Granted, there can only be one reigning champion; that’s the nature of the game. And since Rousey has had a clean, white-hot career, she deserves it. However, in order to foster the growth and development of women in the sport, there needs to be competition. If a woman looks less feminine than Rousey, but is a formidable competitor, she deserves to get the coverage and celebrity that Rousey does. If one lady is the sole face of the sport, what happens when she is gone? In order to promote women fighters in the UFC, there needs to be a continual output of up-and-coming contenders (looks NOT accounted for) that will carry the torch and perpetuate the tradition. Ronda Rousey can set the bar, but women fighters across the world can’t let her be all that there is for the sport. Julia Randall is obsessed with fantasy football, any good Merlot, and the most recent season of American Horror Story. When she’s not singing (really well) you can find her writing for DraftStreet.